Well, here we are! 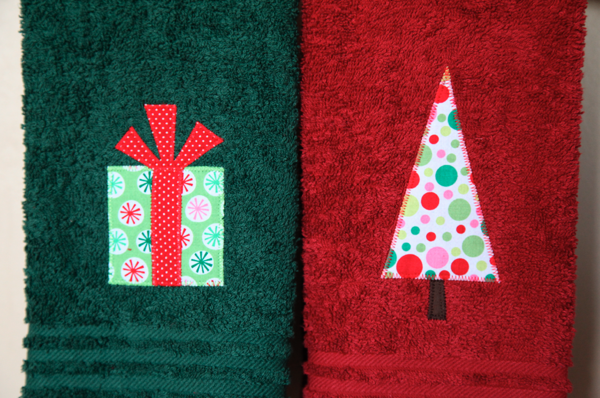 Our first Christmas projects for 2012! How does it feel to get a jump start on the holiday season already? In all honesty, I’d planned on doing a fairly large project this month, but time got away with me with all our home buying and moving plans, so I fell back to an idea I’ve been wanting to share for quite awhile. 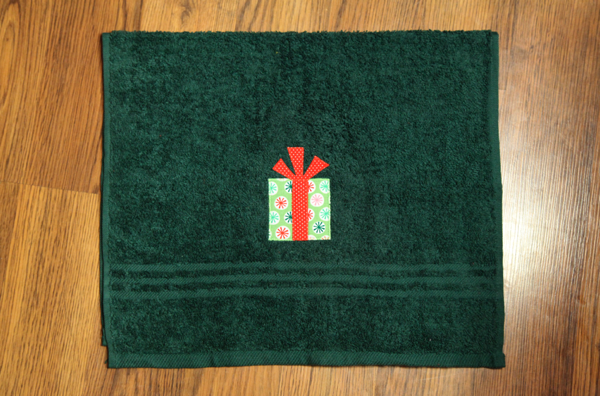 For Christmas 2010 I appliqued towels for my Mom, sister, and Aunt. I just put their last initials for a little personalization, but I was wild about the way they turned out! And best of all, they’re actually used on a regular basis! I’ve been itching to make some for holidays. 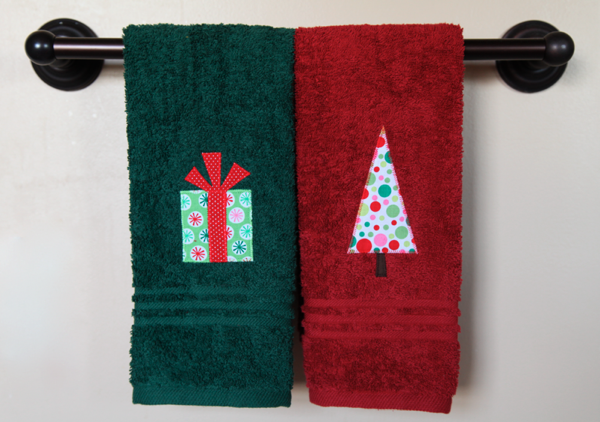 It’s an inexpensive and fun way to celebrate, and they make really great gifts! I think they’d even be great as a wedding gift, especially if the couple has registered for towels so you can get some you know they like and will match their home. 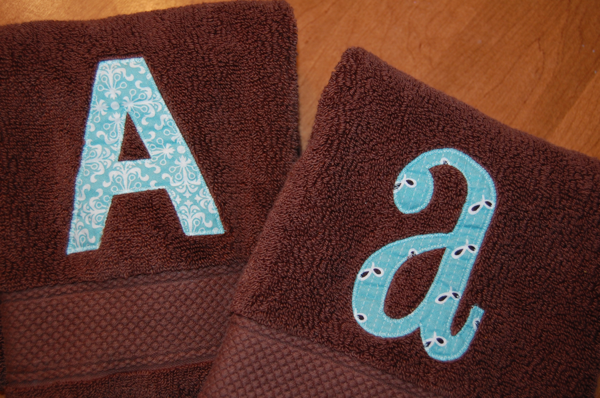 Personalized with their initials or even “his” and “hers” would be darling! These are a quick and easy project for sure! I simply chose some designs and appliqued the way I always do! **For tips and information see my Applique and Applique Curves Tutorials. 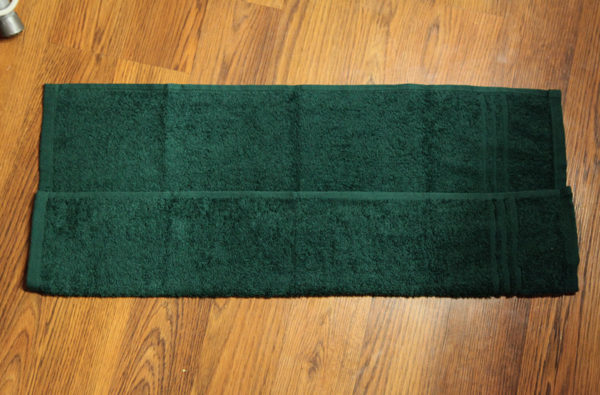 To get the design in the right place, lay the towel down face down, with the inside of the towel up. then fold in half. You’ll be left with a small area to work with, but is perfect for how it will hang. You can use the sides for reference points and begin ironing on your applique! When finished, your design will be perfectly placed and ready for use! 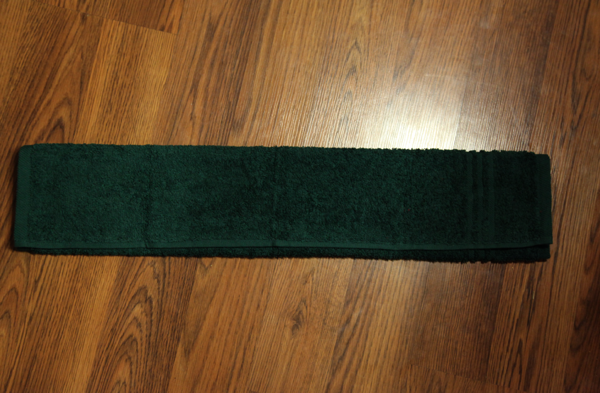 I have more towels I haven’t had a chance to adorn yet, but I’ll get to them very soon! I did manage to sneak a generic one in for myself! If you don’t want to do holiday images as a gift, consider doing them this way instead. Ready to share your creations? I can’t wait to see them! If you do not have a blog, please feel free to email me your photos. Some of you have done this already and I’m loving it! Keep ’em coming! Please add my Handmade Christmas 2012 button to your blog to spread the word about participation! I haven’t made anything yet but I’m going to make this for the kids for Christmas. I like the towels!! I am going to make these! I always like quick gifts!! I am like the least crafty person on the face of God’s green Earth but I love watching others craft. 🙂 I put your button on my blog so others can find you! I don’t have a blog (yet?! ), so I posted my first batch of christmas baubles to my BurdaStyle Profile (hope the links work). I like your towels and am really excited to see what everybody else came up with. Will you publish all the pictures on your blog that people mailed you? 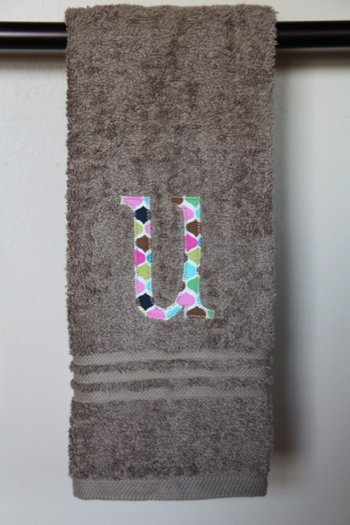 This is totally cute, I have not made them with hand towels, but i do make them with burp cloths for baby showers. That way you don’t have to worry about getting yours mixed up with other burp cloths. I made crinkle corner baby tag blankets. The one I posted is actually a gift for a new baby, but I plan to make them personalized for Christmas gifts too. I’m working on my third Christmas one right now. Wooohooo for an early start! Wow, what a great idea! I love it! I haven’t made anything for gifts, but lately I’ve been in the mood to finish up projects that I’ve had stashed away for too long! I love this idea. I also love your blog and it has inspired me so much. I have yet to try applique again–the first time was in 1984 –during a 4th grade 4-H project. It did not go well. 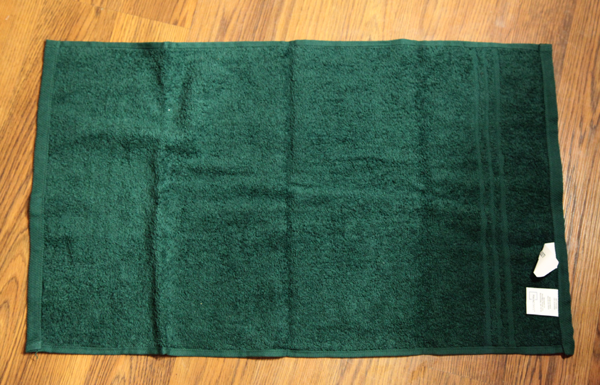 So, I need to try again and a T-shirt for Valentine’s Day or some new hand towels for our bathroom might be the project. I do need to start posting gift ideas though because December always seems to come quickly!!! I love all of your tutorials! I’ve really gotten the hang of applique and have made tons of great stuff for my munchkin and for baby girls for others. Are there any other fonts that you use? 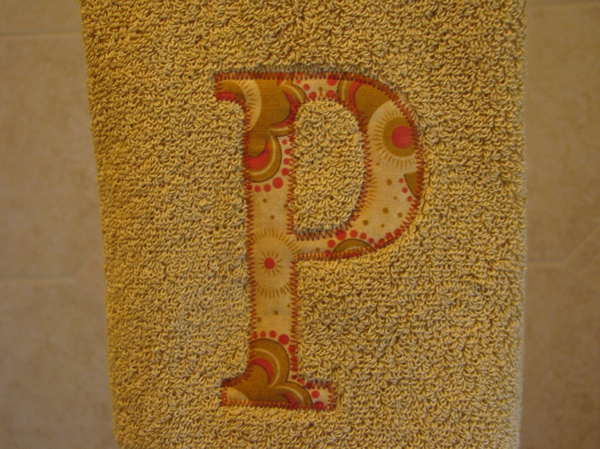 I love the one in the tutorial for appliques, but would like some more grown up ones for gifts for friends. Any suggestions would be appreciated! Thanks! Hi Emily! For more adult looking fonts I like to use the basics like Arial and Times New Roman. I usually base the font on the project and the fabric I’m using so they all get traded around. 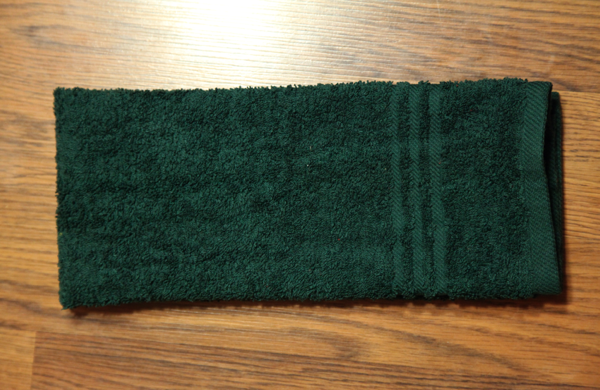 I just made two hand towels for gifts in a secret Santa gift exchange! Thanks for the idea! I think I will make a couple more for myself and my son’s teachers!